Preparation time: 15 minutes. Baking time: 1 hour. Preheat oven to 325°F. 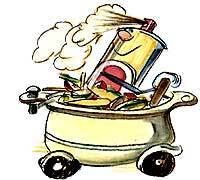 Spray a 3-quart casserole or Dutch oven with cooking spray. Spread frozen vegetables in an even layer in the casserole. Follow with layers of green pepper strips, baby carrots, zucchini slices, tomato pieces, and celery. Melt margarine in skillet. Add onion and garlic, sautéing until tender. Stir in broth granules, wine, salt, and pepper. Pour skillet mixture over vegetables. Cover casserole and bake for approximately 1 hour until vegetables are crisp-tender. Exchanges per serving: 2 vegetable, 1/2 fat. Carbohydrate choices: 1.